January/February 2019 www.coalage.com 41 operating ideas continued dial Pressure. With this innovative design, the changes in contact angle and surface area are minimized as the blade wears, helping to maintain its effectiveness throughout the cleaner's service life. New air-powered tensioning systems are automated for precise monitoring and tensioning throughout all stages of blade life, reducing the labor typically required to maintain optimum blade pressure and extending the service life of both the belt and the cleaner. Equipped with sensors to confirm that the belt is loaded and run- ning, the devices automatically back the blade away during stoppages or when the conveyor is running empty, minimizing unnecessary wear to both the belt and cleaner. The result is consistently correct blade tension, with reduced power de- mand on startup, all managed without op- erator intervention. For locations lacking convenient power access, one self-con- tained design uses the moving conveyor to generate its own electricity, which powers a small air compressor to maintain opti- mum blade pressure at all times. Even the best-designed and most effi- cient of mechanical belt cleaning systems require periodic maintenance and/or ad- justment, or performance will deteriorate over time. Proper tensioning of belt-clean- ing systems minimizes wear on the belt and cleaner blades, helping to prevent damage and ensure efficient cleaning action. Belt cleaners must be engineered for durability and simple maintenance, and conveyors should be designed to enable easy service, including required clearances for access. Service chores that are straightforward and "worker friendly" are more likely to be per- formed on a consistent basis. The use of factory-trained and certified specialty contractors can also help ensure that belt cleaner maintenance is done properly, and on an appropriate schedule. Further, experienced service technicians often notice other developing systems or component problems that can be avoided if they are addressed before a catastrophic failure occurs, helping conveyor operators avoid potential equipment damaging and expensive unplanned downtime. 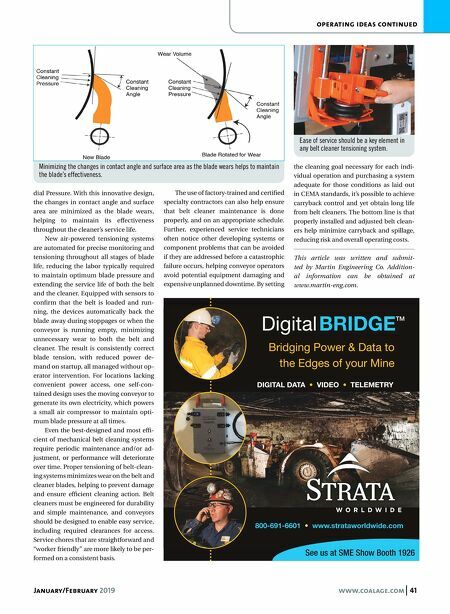 By setting the cleaning goal necessary for each indi- vidual operation and purchasing a system adequate for those conditions as laid out in CEMA standards, it's possible to achieve carryback control and yet obtain long life from belt cleaners. The bottom line is that properly installed and adjusted belt clean- ers help minimize carryback and spillage, reducing risk and overall operating costs. 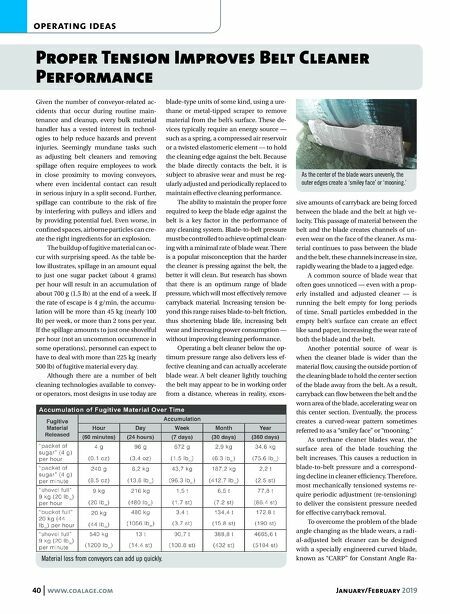 This article was written and submit- ted by Martin Engineering Co. Addition- al information can be obtained at www.martin-eng.com. Minimizing the changes in contact angle and surface area as the blade wears helps to maintain the blade's effectiveness. Ease of service should be a key element in any belt cleaner tensioning system.